Bio-Gro comes in both an unflavored powder and capsules that are easy to use. For the powder, mix 2 – 3 servings twice daily in liquid such as a protein shake, pre-workout, or amino drink, and thoroughly agitate or blend; or mix with soft foods such as oatmeal, cereal, or yogurt. Or take 5 – 7 capsules with a class of water, amino, pre-workout, or protein shake. Bio-Gro can be taken anytime with or without food. Bio-Gro is a true "game-changer" from iSatori. The first to introduce a new breed of supplementation called Bio-Active Peptides. You can think of Bio-Gro as "fertilizer for your muscles." 2. More convenient. Unlike bulky tablets and flavored powders, Bio-Gro is an unflavored powder in its raw form that is virtually tasteless. Though it doesn't mix well in plain water, it does mix easily into almost everything else—from your protein shake to pre-workout to amino drink, and even in soft foods like yogurt, cereal, or oatmeal, and more. 3. More scientific research. There are over 32 published clinical studies that back up the suggested benefits of the primary ingredient in Bio-Gro. And more importantly, these studies were conducted mostly on well-trained athletes, participants who traditionally show less positive effects compared to untrained individuals. 5. Highest quality and banned-substance tested. 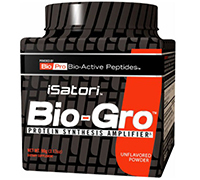 Because iSatori controls the domestic source of our ingredient and has engineered the first micro-concentrated, low molecular weight Bio-Active Peptides found in Bio-Gro, you can trust and count on every batch being of the highest quality and consistency; and what's more, each batch is tested and certified free of any banned substances (via Informed Choice™), and is GRAS certified, HALAL, Kosher, and produced in a certified GMP (good manufacturing practice) facility right here in the USA. 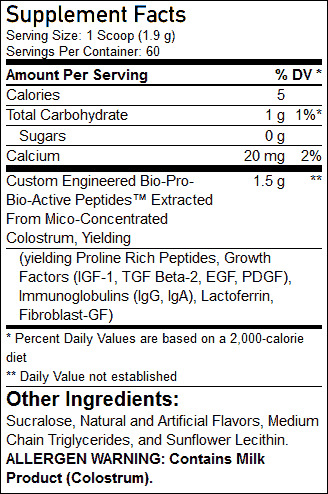 Directions For Bio-Gro: As a dietary supplement, mix 2 to 3 servings of Bio-Gro™ twice daily in 6 to 9 oz of cold liquid, or mix in soft food (yogurt, oatmeal, protein shake, etc). Bio-Gro can be taken anytime with or without food. Warnings: KEEP OUT OF REACH OF CHILDREN. Do not use this product if you are pregnant, nursing, or contemplating pregnancy. If you, or your doctor, have any questions about this product, please call 1-866-688-7679.Not intended for individuals under the age of 18, unless instructed by a doctor. Consult a physician or healthcare provider before using this or any other dietary supplement or starting any exercise program. Exposure to moisture and humidity may cause clumping but will not affect product efficacy. Do not use if safety seal around cap is broken.